Birthplace : Cambridge, Ohio, U.S.
John Herschel Glenn, Jr. is a former United States Marine Corps pilot, astronaut and United States senator who was the first American to orbit the Earth and third American in space. Glenn was a Marine Corps fighter pilot before joining NASA's Mercury program as a member of NASA's original astronaut group. He orbited the Earth in Friendship 7 in 1962. After retiring from NASA, he entered politics as a Democrat and represented Ohio in the United States Senate from 1974 to 1999. John Glenn, Jr. circled Earth on the Mercury 6 space mission in 1962, becoming the first American to make a complete Earth orbit. Glenn was a fighter pilot in both World War II and the Korean War. He became one of America's original seven Mercury astronauts and orbited Earth three times on 20 February 1962 in the capsule Friendship 7. (Alan Shepard had been the first American astronaut in space in 1961, but Glenn was the first American to circle the globe. The first man into space overall was Soviet cosmonaut Yuri Gagarin.) Glenn was elected senator from Ohio in 1974, serving until 1998, and ran unsuccessfully for the Democratic presidential nomination in 1984 and 1988. He returned to orbit in late 1998, joining the crew of the space shuttle Discovery in a mission that became a nostalgic salute to a space pioneer. On October 29, 1998, he became the oldest person to fly in space, and the only one to fly in both the Mercury and Space Shuttle programs, when at age 77, he flew on Discovery (STS-95). Glenn and M. Scott Carpenter are the last surviving members of the Mercury Seven. 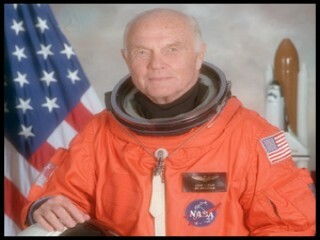 View the full website biography of John Glenn Jr. .